If you have a LEGO lover in your house, you'll want to sign them up for the free LEGO magazine subscription by enrolling them in the free LEGO Life club. The LEGO Life magazine is a free magazine that is full of all things LEGO including building steps, comic adventures, puzzles, games, contests, and challenges. Your child will receive 5 free issues a year for 2 years. After that, they'll just need to renew to keep receiving issues. All 5 to 10-year-old children who live in the United States and Canada can sign-up for the free LEGO Life magazine. Visit the LEGO Life Magazine Sign Up and fill out your child's name, gender, date of birth, and your email. You'll then be sent an email to the address you provided so you can confirm that it's okay for your child to join the LEGO Club. After clicking the confirmation link, you'll then be able to provide their mailing address and your phone number to finish the sign-up process. You also might want to fill out the LEGO consent form, so your child can submit their LEGO creation to be in the next magazine, write a letter to the magazine, or enter contests. This form can be sent in with their photo or letter. The first issue of your free LEGO Life magazine will arrive in the mail within 6-14 weeks depending on when the next issue is released and when you've requested a subscription. While you're waiting for it to arrive, you can check out the latest LEGO magazine as a PDF. If you have a child under the age of 5, they're going to love these free LEGO Duplo apps developed for preschool-age children. There are also building challenges and LEGO activities. Kids older than 10 are encouraged to download the LEGO Life app that includes challenges, minifigure makers, character updates, building ideas, polls, and the latest LEGO news. They even get to create their own minifigure to be their online avatar and connect with real-life friends. 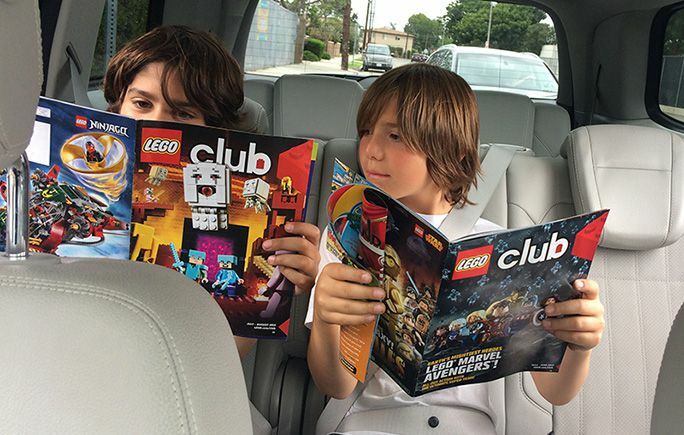 Besides the free LEGO Life magazine, there are other perks from being a member of the LEGO Life Club. There's an interactive LEGO Life magazine, online stories, events, videos, and building steps. There are also free activities, comic strips, coloring sheets, wallpapers, and posters just for LEGO City and LEGO Ninjago. Kids can learn basic computer coding with Bits & Bricks. LEGO also hosts free LEGO builds for kids each month where they can visit their local LEGO store and build a free model that they'll get to take home for free. Toys R Us also frequently has free LEGO events where kids can take part in building challenges and get free stuff like minifigures, posters, and activity sheets.